Many birdwatchers and householders already keep simple records of the birds that they see using their gardens throughout the year. The collection of such information is incredibly useful and, if carried out in a systematic manner, these weekly observations of birds (or indeed other garden wildlife) can prove very valuable for researchers. 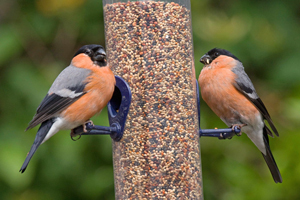 BTO Garden BirdWatch enables you to collect this information in a standardised way alongside similar information from many thousands of other garden birdwatchers. In effect, you are a 'citizen scientist' working in partnership with BTO researchers to answer important questions about how, why and when birds use gardens and the resources they contain. This section of our website provides more information about the project, its origins, methods and the team who work behind the scenes to support you. You will also find our latest news, details of forthcoming talks and events and details of how to contact us. There is also information on some of the other garden-based projects that we run alongside Garden BirdWatch, such as our work on House Sparrows, disease, activity patterns and bird behaviour. Garden BirdWatch is funded through the annual subscription paid by its participants and we are extremely grateful for the support that they provided. If you'd like to join Garden BirdWatch then you can do this online today if you want.